I,m not sure but I feel like the Tab 3 7.0 is fairly better than the Tab 3 lite. No room for voice calls, right ? I have a customized tab, after that i have flashed it, I can't still make calls with it. Anonymous, 06 Jun 2015Facebook app is not working in this tabThe tab support Facebook app with exciting features. Can any one suggest me about this tab..
bari2404, 10 Dec 2014How to transfer songs TO the external sd card FROM bluetooth phone memory? Can anyone please e... moreDownload ES File Maneger and yet it. can i download an HD camera software to improve my tabs camera i sumtimes get poor pics. * This tab supports calling and it does not have a front camera.This tab is not of selfie nor camera lovers. *Tab has an decent battery life with a havy usage it can last 6-7 hrs. *It has jelly bean but all apps i used in the tab support jellybean. *In some high end games it has some lag but its quite toreable.Nor battery comes in way. * it has got wifi direct so i can play bombsquad with my friends. 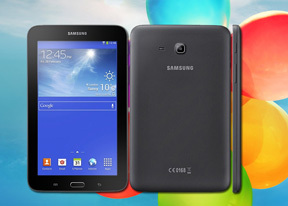 Total of 170 user reviews and opinions for Samsung Galaxy Tab 3 Lite 7.0 3G.